So, today I get to welcome my brand new nephews Samuel and Daniel – I listed Sam first because he is the second born, which means he’ll probably always be listed second after this. 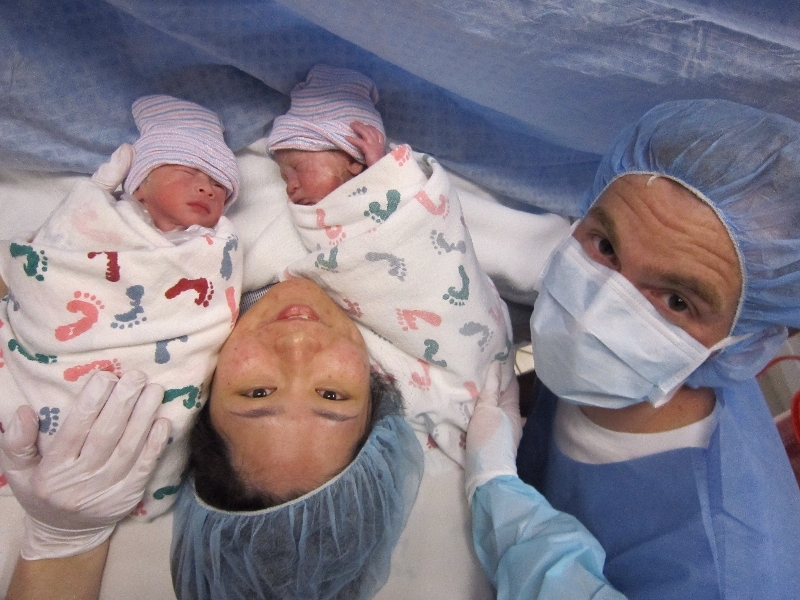 Samuel Ryo was born 16.5 inches long and 2 lbs, 15 ounces – wow! tiny! (Samuel’s on the right in the picture). They were born about 8 weeks early; small, but fully developed and don’t need much help except a Daniel needs a little oxygen to dry his lungs. Mother and twins are doing great, despite the drama today. I’m so glad that Risa’s sounding happy and healthy, I hope her recovery is speedy. I wish that I could go out and see everyone now, but my parents are driving west as I write this. So congratulations to my brother and sister-in-law for being new parents; and thanks to my Aunt Julie, who has been a rock helping them get to the doctor and understanding what he says and asking the right questions; and welcome to the two newest members of our family!! We decided that we are going to ‘forget’ which one was delivered first if they ever ask. Unless someone comes back and finds this post! !